Steve Brooks was born Stephen Axene Brooks on February 17th, 1942, in Moline, Illinois, on the banks of the Mississippi. When he was eleven years old, in his second hometown, McCook, Nebraska, he chose to be called Steve. His dad and his brothers agreed, but his mother did not. He had to reclaim the name Stephen, years later, when he was published under the name Stephen Abhaya (The Dancer in the Heart, Philos Press, 2000, et al) disappointing his publisher, Laura Beausoleil, who knew him as Steve Brooks, a fairly well-known San Francisco poet and performer. 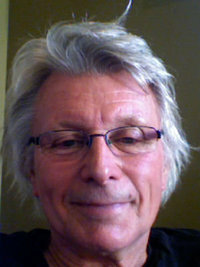 His most recent publisher, Thomas Rain Crowe, changed his name back to Steve Brooks, and Steve accepted the change. Steve has been signing his paintings Abhaya, since returning from India, where he got the name from Poonjaji, also called Papaji, a teacher of Advaita, the practice of no practices. Abhaya means Fearless. In Buddhist lore, Abhaya was the brother of the man who gave Buddha his first ashram, and his name came to mean one who is as close to being enlightened as one can be, without disappearing entirely into being itself. Steve (Abhaya) first thought he should be living like his teacher, but walking on the road, in Lucknow, one day, he thought, “I want to be a poet like Kabir and Rumi,” even though he had never been a student of those great poets. One day, back in Seattle, Rami, an Israeli soccer player, called out, in a booming voice, Steveabhaya! and another name was born. Abhaya is correctly pronounced “Ab-HI-uh”, but more easily pronounced, “Uh-BI-yuh,” like the head-to-toe, black covering women wear in the Middle East, but that word is “abaya”. Still, the association is poetically intriguing. The name Axene was invented by Steve’s great uncle, Charley, who emigrated from Sweden with the name Magnuson. Charley seized on the opportunity, while on Ellis Island, of picking a new name. He picked Axene, for no known reason. Later, he returned to Sweden and reassumed the name Magnuson, but by then, his siblings had emigrated and had taken the name Axene. Steve has used the name Nate Axene as an alter ego in at least two books. Steve Brooks grew up in Moline, Illinois and McCook, Nebraska, then back again in Illinois, went to Grinnell College in Iowa, spent a short time in the graduate art program at Iowa, got married, taught school in California, Illinois, and Connecticut, before returning to graduate school in poetry at San Francisco State, Divorced in the Seventies, Steve has two kids. His son Jaxon created the popular website MilkandCookies.com. He lives in Seattle with his wife Christine. Steve’s daughter Rachel created three great kids, Ava, Julien, and Oscar. Rachel and her husband Kevin lived in Paris, Johannesburg, and Nairobi, now back in Seattle. Steve moved to Seattle in ’86, after 17 years in San Francisco, and after 17 years in Seattle, moved to Ellensburg, WA, where he taught at Central Washington University. In 2011, he moved to Asheville, NC, where he lives with first college sweetheart, Nancy, after a brief fifty-year hiatus. More factual and dramatic detail is provided at length in many of the books on Steveabhaya.com. I’m not slim enough for a Speedo, these days. Say hi to the guys. Good to hear from you. Hi, Steve, I remember you as one of the 5 on the western edge. Spoke with Steve S. yesterday and he gave me your website. Glad to see you’re still at it. I turned to writing kids books in 1992 (after telling stories to my kids) and am lucky to make a living that way. I’m long divorced and long married. Two kids, one graduates in animation from CalArts in May, other a Michelin starred executive chef at Ubuntu in Napa. Merry XmAs! Yes, that’s me. I remember you, too. Hello Steve. The reason for this communication is find out if I need your permission to use the drawings I did for “The Lonely Lion” in another book for children. Would there be any copywrite infringement?